To give you ideas for spectacular places to go away to, for a weekend, or on tour in your camper van, I am carrying on with reviews of the sussex campers top 10 most beautiful places in the UK. 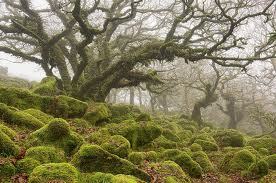 In at number 8 is Wistman’s Wood in Dartmoor. Enter the mystical world of the ‘Wood of the Wisemen’, an ancient forest in Devon, said to be the most haunted part of Dartmoor. The silhouettes of the stunted and gnarled oak trees, with their finger like branches, entwine against the backdrop of the beautiful moors, creating an eerily enchanting atmosphere. If stories of the supernatural don’t put you off, then this is a great place to visit! Thousands of visitors flock to see the sites of the Wistmans Wood, situated on the slopes of the west dart river, with fantastic walking and cycling trails all around the moors. Park near the Two Bridges Hotel, close to Princetown on the B3357, which runs between Tavistock and Ashburton, and embark on a journey to the mysterious wood. Moss covered boulders line the forest floor so take care if you dare to enter, or just walk the path along the top of the woods for a safe look in and a stunning picture. From the wood, climb to the summit of Longaford Tor, where you can enjoy a windy, panoramic view of Dartmoor, and take the opportunity to explore the rest of this historical national park. Nearby, Barley Meadow Camping and Caravanning Site offers a peaceful retreat with easy access to the surrounding Devon area. Along with the standard facilities you would expect to find at an award winning camp site, there are also buses to Okehampton and Exeter right outside, and a local Fish & Chip van which stops on site. Enjoy local produce from the on site shop and nearby Inns, horse ride on the moors, or take a trip to one of the beautiful beaches of South Devon. Find us on Facebook to let us know what would be in your top 10 or contact us to have a chat about making your dream camper a reality.